What an ingenious solution! Only S could have thought that one up – I'm very impressed. 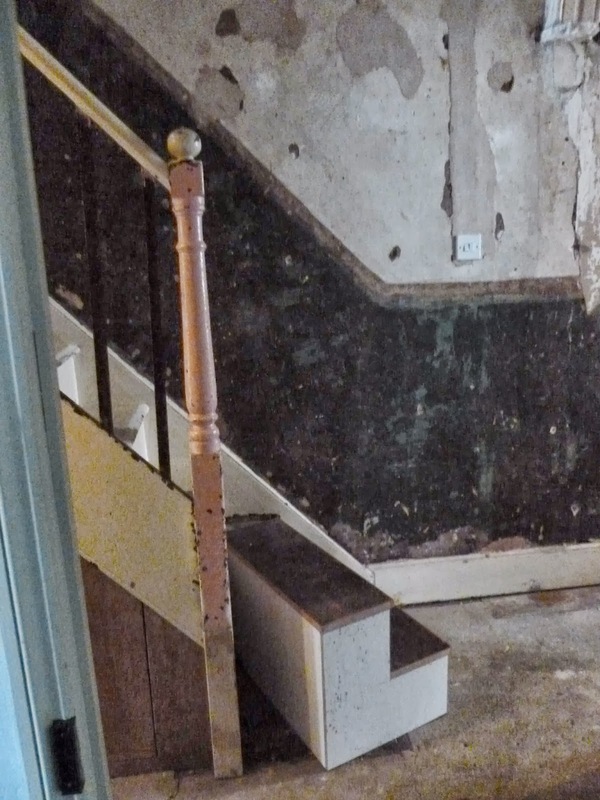 I like the fact that the original feature of the newel post is still very much intact (not sure A would have had such loyalty) and yet it allows for the house to function in the way that you need it to (always a Butler trademark). 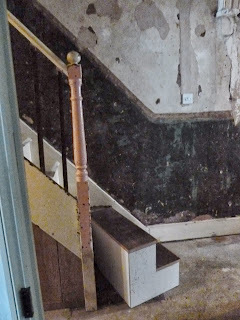 The walls are painted a dark maroonish-brown colour P, and that lower section goes all the way up to the top of the stairs. Yes, we wanted to keep the newel post - the ball cap on the top is very round, and I can't find another quite like it, (it's such a crazy pink colour, too!) so S will probably end up making a similar one to go at the top of the stairs (there is an acorn-shaped one there at the moment - Albert's work I wonder? - and it's just all wrong!) at some point in the next however many years. If you were able to go back up the stairs again, you would see the 'new' cupboard at the end of the hallway, but nevermind - on with carrying along the lower hallway on the way to the kitchen I think! Crazy colour combinations! I love the fact that your house has evolved so much during the time we have been writing this blog. Hallways are such a mammoth undertaking in terms of decoration, which can be quite frustrating as they are such transient spaces – we never really spend anytime within them – we just pass through.